Letter 19 was hard. The cookie was not bad. The hiding place for the clue was not surprising. The hint in the letter is right on. The problem was having to be supper zoomed in on the clue to see it. I looked at that the clue’s location a dozen times before I asked for a hint and a couple of times after. Then I finally opened up the Build Tool and started doing area selections and counting the items selected until I saw an anomaly. Then I started deselecting things until I had one item selected that I could not see. I finally got zoomed in close enough and it rezzed when my camera was in the right place. Frustrating. The Mysterious Letter was hard to find. I spent a lot of time looking for it. It is well hidden. There is no problem with it not rendering, it is just very well hidden. But, as with most of the important clues, it is visible if you are looking in the right place. This murder scene is a really nice build. Be sure to view it using local Windlight. You can see from most of my pictures I change my Windlight settings to get pictures of other ‘detectives’. While the build still has some LoD problems, the small area and short line of sight distances minimize the problem. Letter 20 is a major puzzle. We have a whole region to search. Plus getting from place to place is a puzzle in itself. Be daring. You’ll find what appears to be a series of clues. I’m not sure, but I think they are a diversion to get us to explore the island. There is an underground cave, stairs down to the water, a piano, movie projector, neat pond, and the objects the pseudo-clues lead to. While these did not lead me to the clue, they were fun to find. My best clue in this region was the cookie. I suggest you set the Debug Setting RenderVolumeLODFactor to 4. It will through a load on the region and degrade your viewer performance some, but this is a hopeless search without that change. The LoD levels here are horrible. If your viewer is slow loading the region and you don’t have the setting changed, it could be really hard to find the clue. I know I passed over the clue when I had mine set to 1.2. Later, after searching the island and setting to 4.0, I found it where I had already looked. Once you have completed this leg of the game/hunt, remember to change your setting for RenderVolumeLODFactor back to something more reasonable and nice to the regions. In all the other days searching we find a Mysterious Letter. Not here. You’ll have to watch your HUD to know when you have found the last clue. There is a cookie and something else you need to find to move ahead. 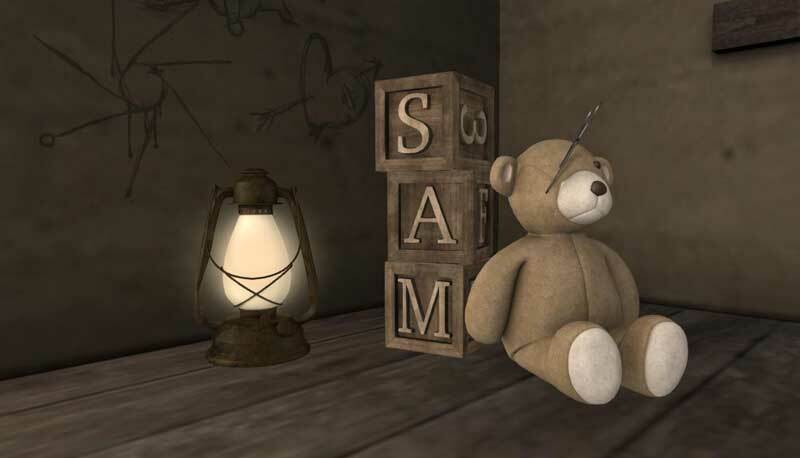 This entry was posted in Games, Second Life. Bookmark the permalink.